One fine day, Eryi went to eat the melon that she had been SO looking forward to... but it was nowhere to be found! Then she noticed a note on the table. She picked it up and read: "Your melon looked delicious, so I took it. From Farta X"
Fuming with rage, Eryi set out from her house to get her melon back from Farta. Eryi's Action is a 2D ‘trapformer’ by developer Xtal Sword that is visually inspired by Super Mario, but has gameplay akin to games like I Wanna Be the Guy. Don’t be fooled by its adorably charming looks – this game abounds in traps and wants you to die! However, where IWBTG was murderously difficult, Eryi's Action is additively challenging and FUN! Trap placement is often laugh-out-loud funny and seriously engaging. Some traps simply need to be learned to avoided, but others are puzzles that will require your skill and wits to beat. 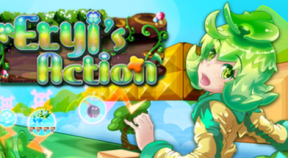 Either way, Eryi’s action delivers laughs, frustrating and satisfaction & all for just $4.99! FUN! You'll die a lot, but you WILL go back for more! Xtal Sword and Nyu Media Ltd assume no responsibility for any damage, injury, rage, addiction or mental trauma caused by playing this game. Play at your own risk!